A woman prays outside the closed doors of the Church of the Holy Sepulcher, traditionally believed by many Christians to be the site of the crucifixion and burial of Jesus Christ, in Jerusalem, Feb. 27, 2018. Christian leaders said Tuesday that they will reopen the Church of the Holy Sepulcher in Jerusalem after Israeli officials suspended a plan to impose taxes on church properties in the holy city. Major denominations, including the Roman Catholic and Greek Orthodox churches, said in a statement that the church would reopen early Wednesday after being closed for three days to protest the Israeli tax plan. The Israeli move had enraged religious leaders, who shuttered one of Christianity's most important holy sites ahead of the busy Easter season. The church is revered as the site where Jesus was crucified and resurrected. 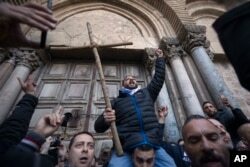 Demonstrators protest outside the closed doors of the Church of the Holy Sepulcher, traditionally believed by many Christians to be the site of the crucifixion and burial of Jesus Christ, in Jerusalem, Feb. 27, 2018. Jerusalem's mayor had backed down on the tax plan earlier Tuesday. Prime Minister Benjamin Netanyahu's office said a professional team was being established to negotiate with church officials to "formulate a solution." "As a result, the Jerusalem Municipality is suspending the collection actions it has taken in recent weeks," it said. The statement from major Christian denominations said the churches look forward to engaging with the team to ensure Jerusalem "remains a place where the three monotheistic faiths may live and thrive together." Christian leaders closed the famed church on Sunday to protest an order by Jerusalem Mayor Nir Barkat to begin taxing their properties. Barkat stressed that his decision affected only commercial properties, such as hotels, restaurants and offices, and not houses of worship. He said other cities followed similar practices worldwide. 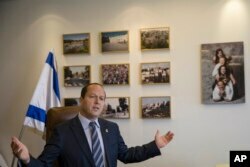 Jerusalem Mayor Nir Barkat speaks during an interview with The Associated Press in Jerusalem, Feb. 27, 2018. "As the mayor of the city of Jerusalem, my goal and role is to make sure people pay their taxes," he said in an interview earlier Tuesday. "We have no negative or bad intentions here." In Tuesday's announcement, Netanyahu said Cabinet Minister Tzachi Hanegbi would head the new negotiating committee, which will include representatives from the city as well as the finance, foreign and interior ministries. "The team will negotiate with the representatives of the churches to resolve the issue," it said. In addition to suspending tax collection, Netanyahu's office said that proposed legislation governing the sale of church lands in Jerusalem was also being suspended.